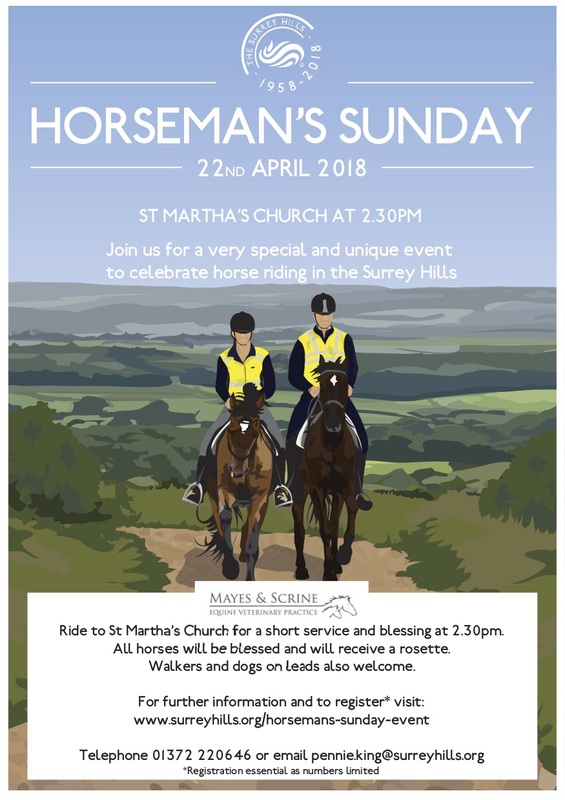 Walkers, dogs and their owners, families and friends are all welcome (as well as horse riders) to assemble at St Martha’s Church on Sunday April 28 for 2.30pm. This is when the horses will be blessed by Reverend Stephanie Sokolowski which is quite a spectacle, and celebrates horse riding in the Surrey Hills. On this day, horse riders are allowed to bring their horses right up to the church walls, enjoying the magnificent southerly views from the top of the hill. Stewards will be on hand to act as marshals for riders and spectators, who will be encouraged to safely watch the short service from inside the cemetery walls. Riders, please register free in advance – see the poster for details click below. This is a Surrey Hills event. Litter-free Chilworth! We’ve made a start! Three volunteers, inspired and led by a member of St Martha Parish Council spent a productive morning clearing litter from the verges of the Main Road at the east end of the village. It is hoped that our other Parish Council will follow suit and lead a similar effort at the west end of the village. Four more or less whole car wheel hubs, as well as rather a lot of discarded drinks containers, bottles and beer cans were also picked up, with equipment provided by SCC. This equipment will be retained to inspire others to use it around our village! Divine Mercy Sunday will be celebrated at Chilworth Abbey from 1.45-4.30 pm on April 28th, 2019. In collaboration with St Joseph’s Deanery, the relic of St Faustina will be venerated, the Image of the Divine Mercy blessed, followed by a procession through the grounds and adoration of the Blessed Sacrament. Rev Deacon J. Michael Phillips will preach on the Message of Divine Mercy from Saint Faustina. Please bring a friend who may be searching for God’s mercy. You are warmly invited to a presentation of the eighth episode of ‘Catholicism – a journey to the heart of the faith’, by the acclaimed author and speaker Bishop Robert Barron, on Saturday April the 6th, 2019. This is a Chilworth Abbey Study Day given by Fr John Seddon OSB, who will contextualise the episode and then teach and lead discussion about its subject matter. The day begins with Mass at 9.00 am, followed by coffee. The eighth film investigates ‘A Vast company of Witnesses: The Communion of Saints’, which will be shown, chapter by chapter followed by teaching and discussion. Midday prayer and lunch will divide the day and concludes at 4.00 pm. Come to part, or all of the day, as it suits you. Bring a packed lunch and if you can, a friend. Tea and coffee is provided. St Augustine’s Abbey, Sample Oak Lane, Chilworth, Near Guildford. GU4 8QR. This year the Chilworth Care Committee are celebrating 40 years of service to the villagers of Chilworth. The first celebration will be a visit by the Mayor of Guildford, Councillor Mike Parsons and his wife, to our weekly Coffee Morning on Thursday 25th April 2019. We would like to invite as many people as possible to this event, which will be held in the St. Thomas’ Church Room, New Road, from 9.30 a.m. to 12 noon. The Mayor will be arriving at 10 a.m. and everyone will have the chance to sit down with coffee and cakes and help us celebrate the remarkable achievement of 40 years entirely voluntary service and even learn a little of our work and the people who have served over the years. Please come and join us and help us celebrate. The first meeting of a new group, Friends of the Gunpowder Mills, met recently with the aim of promoting the site to locals and helping to make it a strong community asset. The meeting was convened by St Martha Parish Council, and the group has strong continuing support from them, with Graham Brown the Chair. Continuity and expertise from the old group has been retained, but this is a fresh group of people from across the village. It is hoped that with good will from GBC, also represented on the group, the popular volunteering sessions will continue with the Countryside Wardens in attendance. It was agreed at the first meeting that the group should work towards contributing to Heritage weekend, a national event that celebrates our historic places. This will take place during the weekend of September 14/15 this year. The Parish Council will also continue to hold the annual Gunpowder Mills meeting in the autumn.